Fiction – paperback; Vintage; 282 pages; 2005. On Saturday February 15, 2003 almost a million people took to the streets of London to protest against the impending war in Iraq. It was the biggest ever demonstration witnessed in the UK. 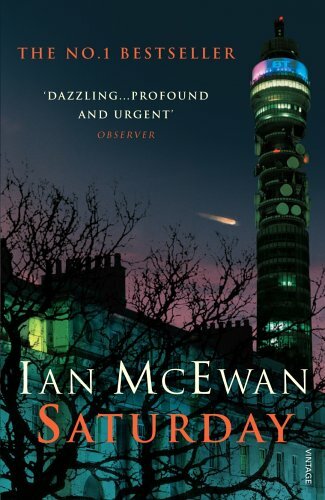 As someone who took part in the Stop the War march, I was keen to read Saturday by Ian McEwan because it is famously set in London on that very day. But the protest is a mere backdrop to a more deeply personal story, that of a day-in-the-life of a well-established and highly successful neurosurgeon, Henry Perowne, whose comfortable existence is rocked by a string of unforeseen events. Perowne’s normal Saturday — playing squash with a colleague, watching his son’s band rehearsal, shopping for food and then preparing a lavish family meal in preparation for his daughter’s arrival home after a stint away — gets slightly turned on its head when, first, in the early hours of the morning, he stands at his bedroom window and sees a burning aeroplane arc across the sky towards Heathrow Airport, and second, when he is involved in a very minor car accident that turns into a potentially life-threatening situation. These dual events turn out to be thwarted catastrophes, but there’s an air of menace that permeates Perowne’s thoughts and deeds throughout the day. In many ways, his deeply personal — and somewhat selfish — fears echo that of the country’s citizens at large who are determined to stop the Government heading into a war that no-one wants. But Perowne lives a fairly sheltered existence where the harsh realities of the wider world rarely intrude. Even the anti-war demonstration, from which he views at a distance, only serves to irritate him. For much of this novel, the reader could be excused for thinking that not much seems to happen in Saturday. Perowne’s dull routine is punctuated by a series of unexpected incidents, but McEwan tends not to focus too much on the actual events but on what Perowne thinks about them. It’s a very cerebral book (quite clever when you consider that the lead character makes his living operating on people’s brains) until you come to the unexpected, and somewhat shocking climax, which takes the action up a gear or two. I’ve made no secret that I think McEwan is a brilliant writer. In this book, much hyped at the time of release, he delivers a carefully considered and distinctly British view of the modern world, where terrorism has begun to intrude on every day lives. This book is essentially about a rich and successful man coming to terms with the fact that money does not buy everything — not even your peace of mind. You just made me fall in love with you a little bit. Might have to try this one. I didn’t like Atonement, so I’m unsure whether to try this one or On Chesil Beach. This one is hovering near the top of my book pile. I’ve read part of it (loved) but life got in the way as it often does. Glad to see that you liked it! I’ve got Saturday, plus a couple others of McEwan’s, but I’ve held off reading them because I enjoyed Atonement so much, and I’ve heard less than stellar reactions to some of his other books. Glad to hear I have nothing to fear with this one! Currently I’m reading Zola and have been struck by how much the two writers mine the same vein of realism. If you’re looking for good summer reading I’d recommend both Saturday and Zola’s The Kill. Thanks for your comment and the links. I’ve not ever read Zola but will it sounds like I need to rectify the situation! I agree this is a stunning book – it really taps into the anxious mood of the period. I thought the ending was a little implausible to be honest. For me McEwan’s endings are often unsatisfyingly prosaic compared to the subtler tensions that proceed them. But no-one writes as well about the human conscience as McEwan. My favourite is definitely ‘The Innocent’, which was made into a film I believe. It is ostensibly a very exciting thriller, but has that emotional and psychological richness unique to the author. Jamesewan, I keep meaning to read more McEwan books but just never get around to it. Interesting that you rate The Innocent so highly. I believe I have a cheap second-hand copy lurking somewhere… must dig it out.